Below are Box Office Collection Report of bollywood film 'Poster Boys' With his review, budget and total box office and worldwide collection status. Poster Boys movie lead star cast is Sunny Deol, Bobby Deol. 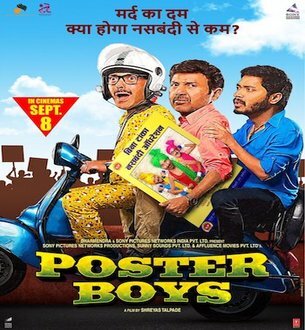 Poster Boys is an indian Comedy, Drama, Romantic Film of 2017, directed by Shreyas Talpade & produced by Sony Pictures, Sunny Sounds Pvt Ltd.
Poster Boys film Released in over 1000+ screens in India. This film, which released alongside Arjun Rampal’s Daddy, has earned Rs 2.40 crore on Saturday, taking the total to Rs 4.15 crore. The film, which is the remake of the Marathi movie Poshter Boyz, brings back the popular Deol brothers on screen after four years. Both Sunny Deol and Bobby Deol enjoy a strong fan base in the northern side of India. Storyline:- Three men face ridicule from their families and fellow villagers after they appear on a poster that promotes vasectomies. They soon embark on a mission to prove that they are victims of the system.